Register to receive all of the event details. We’re excited to make an impact on the Gila River! 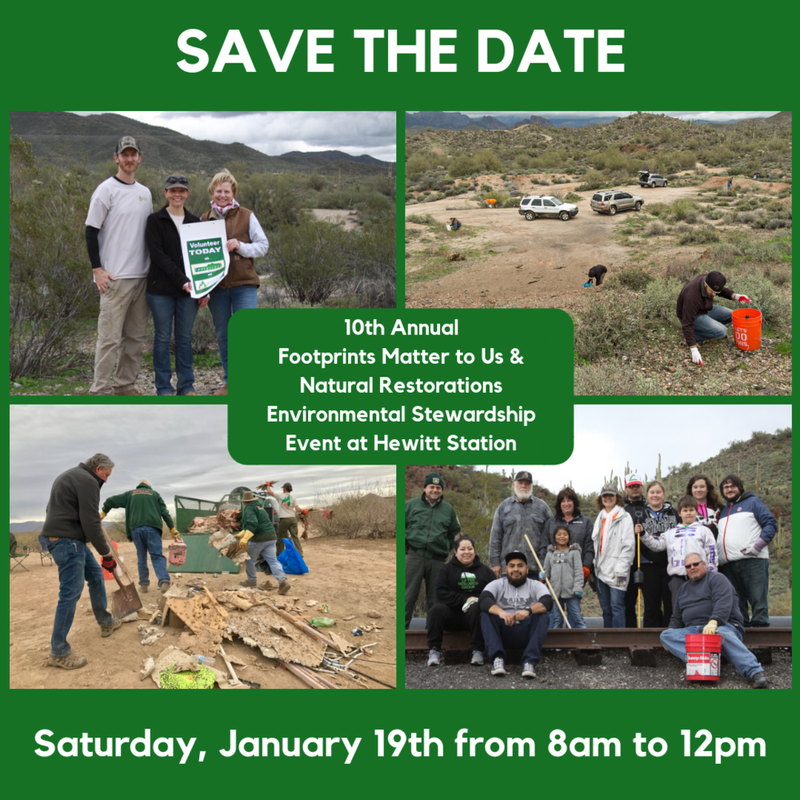 Join Natural Restorations, REI, and Arizona Game & Fish for our Inaugural Base & Meridian Wildlife Area Cleanup along the Gila River on Saturday, December 1st from 9am to 1pm. If your business or organization would like to be an event sponsor, please contact Nicole at contact@naturalrestorations.org. We can provide tax-deductible donation receipts for your support. Arizona Goat Yoga is teaming up with Natural Restorations to bring you Plogging! Join us for a morning of fun and stewardship as we jog and pick up trash along the Lower Salt River at Phon D Sutton Recreation Area on Tuesday, October 23rd from 9am to 10am. Click the button below to register and we will send you all of the details, including directions. What is Plogging? Picking up trash while jogging! This exercise-eco-friendly activity started in Sweden and has spread across the world! With increased concerns about pollution, people everywhere are making their workouts good for the Earths health too! Instead of cursing trash as you jog by it, why not pick it up?! Its like a treasure hunt every time you head out. The action of picking up trash stretches the back, hamstrings and calves. Its multitasking at its best! Why is Goat Yoga involved? Plogging connects you with nature. Plogging locations have wildlife that can be harmed by the trash people leave behind. Just like in a Goat Yoga class, spending time in nature improves your heart rate, blood pressure, cortisol and even our immune systems. It’s a fun way to Save The Earth and get a workout! Goats even come sometimes! To register for participation and LUNCH from Big Daddy E's Smoking BBQ click the button below and we will send you all of the event details. Please stay tuned for upcoming volunteer opportunities in northern Arizona this summer. The areas we targeted for summer projects are currently under forest closures due to the fire danger. 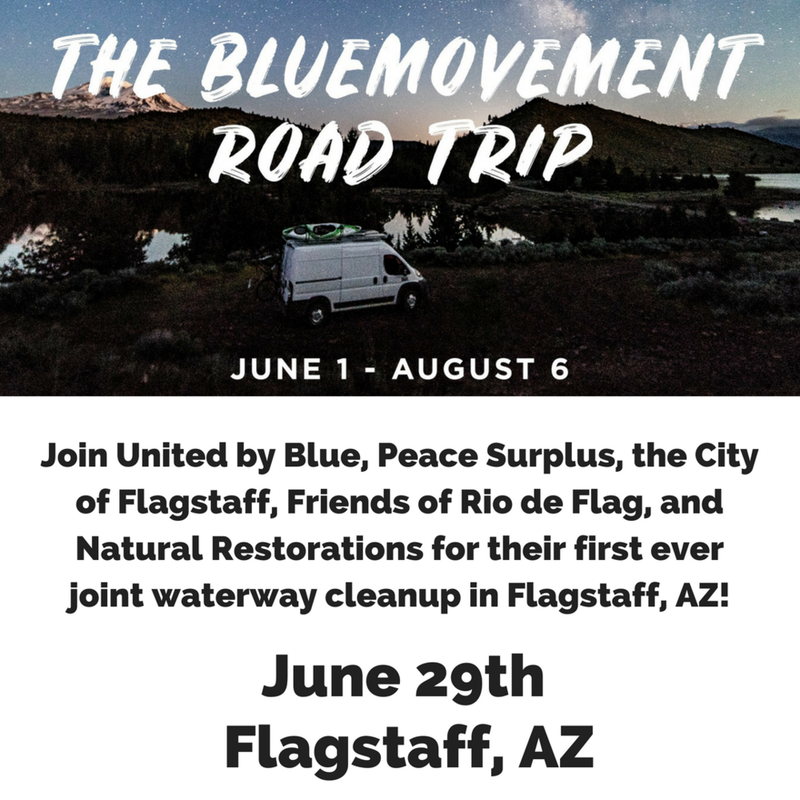 Join United By Blue, Peace Surplus, the City of Flagstaff, Friends of the Rio de Flag, and Natural Restorations for their first ever joint waterway cleanup in Flagstaff, AZ! This cleanup is one of 20 that United by Blue is co-hosting nationwide this summer, from June-August, to establish community partnerships between their specialty retailers, conservation or municipal partners, and volunteers. Join us as we contribute to the cleanup, restoration, and education work that the Friends of Rio de Flag and Natural Restorations do to keep Rio de Flag healthy and beautiful all year round. We will clean up trash and debris along the shoreline of the river, preventing it from flowing downstream and harming wildlife along the way. Join us for an evening of cleaning, games, and protecting the Rio de Flag ecosystem! Please sign up through United By Blue by clicking HERE. Click HERE to register and receive all of the event details, including detailed directions. Due to the road conditions and the distance between sites, we recommend volunteers only come in high clearance vehicles. You don't need 4-wheel drive, but it is a dirt road with bumps along the way and not suitable for low clearance vehicles. We are leaving the meet-up site as a group immediately following the safety briefing at 8 AM. Please arrive at 7:30 AM to sign-in and ensure you hear the entire safety briefing and overall cleanup briefing at 8 AM sharp. If you arrive late, you will not be able to participate. This is our first cleanup on a Monday and a great opportunity for anyone who typically can't make it to our weekend cleanup events. The Beardsley Boulder Pile, a beloved climbing and recreation area located in North Phoenix, is in dire need of your help! Join REI, City of Phoenix Parks & Recreation, Natural Restorations, and local climbing gyms on Saturday, March 10th from 9AM to 12PM to be a quintessential part of our second-annual cleanup project of the area, Trim Beardsley. Registration must go through REI's website, click HERE to be re-directed to REI's registration page. Limited space remaining! In addition to giving this area the grooming it so desperately needs, volunteers will have the awesome opportunity to experience the excellent climbing Beardsley offers, but without all of the broken glass and trash that it's so tragically become notorious for, and with a brand-new set of climbing buddies. Cleanup efforts will begin at 9AM sharp & continue until 12PM with the climbing session taking place afterwards. Coffee, breakfast, cold refreshments & all of the necessary cleaning tools/supplies will be provided for volunteers and participants. A raffle will be held following the cleanup, with multiple prizes geared towards both climbers and outdoor enthusiasts alike. Parking for the event will be located at North Valley Baptist church (carpooling is highly advised). Volunteers are strongly urged to be at the parking area no later than 8:45am. Don't forget to register with REI, space is limited! Click HERE! You can also be a part of the Beardsley Boulders Graffiti Removal Project by helping us reach our fundraising goal of $2500. Click HERE to learn more about the project. Clicking the Donate button below will link you to PayPal. In the Special Instructions box, make a note to let us know your donation is earmarked for this project. You can put Beardsley Boulders, Beardsley, Graffiti Removal, Graffiti, etc. We're excited for our first Tucson Cleanup! Click HERE to register and we will send you all of the details, including detailed directions to parking and the sign-in table. Click HERE to register for participation and FREE lunch! We are excited to be teaming up with Footprints Matter to Us again for the 9th Annual Gold Canyon to Superior Trash Cleanup on Saturday, January 20th. Be sure to register for participation and FREE lunch! Click HERE to register! To register, click HERE and receive directions and details. 1st Annual Green Friday Cleanup! We loved seeing so many people positively respond to REI's Opt Outside campaign for Black Friday. They inspired us to launch the Annual Natural Restorations Green Friday Project beginning Friday, November 24th, 2017. We're hosting a Trash Cleanup close to the Phoenix Valley the Friday after Thanksgiving each year in celebration of Green Friday, a day to get outside, give back, and make an immediate impact by helping us remove trash from natural areas. Join us Friday, November 24th, 2017 from 8AM to Noon as we team up with the Tonto National Forest - Mesa Ranger District for a cleanup along the Salt River. Volunteers will be meeting at Phon D Sutton Recreation Area, please click the link above to register and receive additional details including directions. Click HERE to RSVP or email us at contact@naturalrestorations.org. UPDATE! This event is a way for various outdoor recreation groups to come together for a common cause, removing trash from natural areas we all recreate in. Butcher Jones Recreation Area is a popular destination that's close to the valley and offers something for everyone. Not only is this an event for the OHV (Off-Highway Vehicle) Community, we also have opportunities for volunteers on foot and in the water. 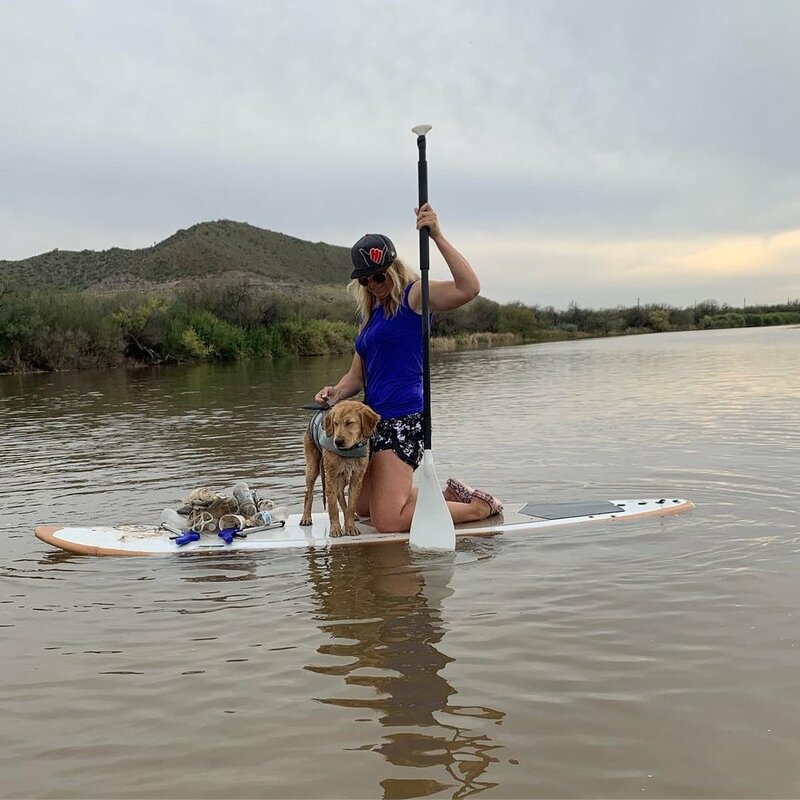 If you own a kayak or non-motorized water craft, we have an opportunity for you to remove trash blown from Butcher Jones Recreation Area into Saguaro Lake. Let's remove the trash before it floats down to the Salt River. Experienced kayakers only, we will not have professional kayak guides to assist inexperienced kayakers at this event. No OHV, 4x4, kayak, or non-motorized water-craft? No problem! We have plenty of opportunities for volunteers on foot to collect trash around the beach around an parking lot. Join Natural Restorations on Saturday, March 11th at 8AM for a land and water cleanup event for the community. This is a great event for the entire family! Volunteers under 18 years old are welcome when accompanied and supervised by an adult. If you're a member of an OHV/4X4 Club or Outdoor Recreation Group and would like to head up a cleanup site, please contact us at contact@naturalrestorations.org. *You do not need an OHV or 4x4 to participate, you can access the parking lot by car. Parking is limited, please carpool! Anyone with an 4x4 or OHV, please park past the cattle guard in the wash so we can free up the parking lot for cars and non OHV's. Click HERE to register or HERE to email us. We're Excited to Host a Trash & Broken Glass Cleanup Project for a Group of Local 6th Graders from San Tan Elementary on Saturday, January 14th at the Gila Lookout at South Mountain Park. We'll share pictures & videos afterwards! Did you know we work with elementary, middle, and high schools to provide hands-on service learning opportunities for their students? Many schools require volunteer hours each semester and we offer the opportunity to get out of the classroom and into nature, making an immediate, visible impact on our natural areas. Join Footprints Matter to Us & Natural Restorations as we support the Town of Superior in a Community Cleanup Event with Local Partners, Superior Chamber of Commerce & Resolution Copper Mining. Volunteers should bring gloves and water, long-handed grabber tools, hats, and rakes or shovels for off-road cleanup areas. Trash bags and extra water will be provided. Coffee & Goodies will be at the registration table. Real Purity Sunscreen & Herbal Insect Repellant provided for volunteers. *Volunteers under the age of 18 years old, contact us via email for additional details. Registration: Superior Airport parking area located on the south side of Hwy. 60, mile marker 225 (1/2 mile east of Boyce Thompson Arboretum). I recently sustained injuries that are preventing Justin and I from making the trip to Flagstaff and hosting the event. We are committed to providing volunteers with the best experience possible in a safe environment and we don’t want to compromise that commitment. We apologize for any inconvenience this may cause and hope everyone can join us at our next event, a Community Cleanup Event surrounding Superior with Footprints Matter to Us on October 1st, details below. Thank you for your support and understanding. Natural Restorations is teaming with the Coconino National Forest on Saturday, July 16th, from 8 a.m. to Noon to remove trash and debris from the areas surrounding the Arizona Trail Passage 32a, off Forest Road 791 & Historic Route 66. Volunteers should wear long pants, sturdy closed toe shoes/boots, and bring thick work gloves. We also encourage volunteers to bring sunglasses and a hat. Real Purity donated Zinc Oxide sunscreen & herbal insect repellant for volunteers to use. The Forest Service requires Personal Protective Equipment; this includes closed toe shoes/boots, gloves, and hard hats. *If you do not have gloves or a hard hat, please let us know & we can reserve them with the Forest Service for you to use that day. A responsible adult must accompany and supervise anyone under the age of 18 years old. Scattered trash & debris in this area provide experiential education opportunities for youth, scout groups and families. Join us for a morning of stewardship and hands-on service learning along a beautiful section of the Arizona Trail. Help us keep Arizona beautiful and have a fun morning with a great group of people. To register and for additional details, please contact Nicole at contact@naturalrestorations.org. From Phoenix: Take I-17 North to Flagstaff. Take I-40 East to Exit 204. Make left and go over the bridge. Follow Historic Route 66 to Forest Service Road 791. Site will be on your right just after the railroad tracks. From Flagstaff: Site is East of the Purina Tower. Take US Hwy 89 to US Route 66. Go East on Route 66 to Forest Service Road 791. Site will be on your left. ***This is a perfect opportunity to get out of the heat, hike, camp, and spend a few hours giving back by cleaning up a beautiful area. Camping: Anywhere off the 303 Road East of the Walnut Canyon entrance road or anywhere along the section of the Arizona Trail Passage 32a close to the cleanup site. Campgrounds: Canyon Vista Campground down Lake Mary Road or KOA off Highway 89. Dispersed camping off Lake Mary Road down Forest Road 3E or Forest Road 867.